Defending champion Sergio Garcia hit three birdies in his first 11 holes to move four shots clear at the top of the leaderboard at the end of the second round of the rain-affected Valderrama Masters. Garcia and Ashley Chesters were tied for first place after the first round on five under par, before Garcia hit a birdie at the 11th to overtake the Englishman. The Spaniard carded a seven under par round of 64 – his lowest score at Valderrama – while Chesters only managed one birdie and sits second on six under par. Scot Marc Warren joins Alvaro Quiros, Gregory Bourdy and Gonzalo Fdez-Castano in joint third, they have all completed their 18 holes and are all four under par. Warren said after the second round: “It’s been a long two rounds of golf with all the delays we’ve had but I’m really pleased with the position I’m in. Lee Westwood, whose son Sam carried his bag, ended up three under at the end of the second round. The tournament, hosted by the Sergio Garcia Foundation, has been affected by the weather and was reduced to 54 holes from the original 72 with the third round potentially taking place or starting tomorrow . Play was suspended for a while yesterday morning before resuming at 11:40am local time. The Valderrama Masters is the last chance in the European Tour for the players to reach the top 116 in the Race to Dubai. On the PGA Tour, Brooks Koepka carded a flawless five-under-par 67 to claim a commanding four-shot advantage after the penultimate round of the CJ Cup at Jeju Island in South Korea. 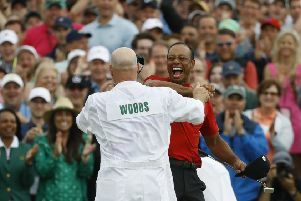 The three-time major winner was able to negotiate a tricky few opening holes before kickstarting his third round with back-to-back birdies around the turn. He collected further gains at the 14th, 17th and 18th to move to 13 under overall ahead of the final 18 holes, with Ian Poulter and halfway leader Scott Piercy his closest challengers. Koepka will have his sights set on a fifth PGA Tour title today – and, remarkably, his first in a non-major since February 2015 when he triumphed at the Phoenix Open. Ryder Cup star Poulter has an outside chance of clinching his second title of the year after birdies at three of his final four holes. Poulter, who triumphed in Houston in April after defeating Beau Hossler in a play-off, bounced back from his only bogey on the fourth hole with a birdie on the ninth. He thrived on the back nine thanks to further birdies on the 12th, 15th, 16th and 18th which helped him card a four-under 68. Piercy sits alongside the Englishman after an eventful level-par 72, in which he followed up five birdies with as many bogeys. Spain’s Rafa Cabrera Bello is among six players who sit on eight under, while former world number one Jason Day lies a shot further back and Paul Casey will have his sights set on at least a top-10 finish after shooting up the leaderboard with a six-under 66. Meanwhile, England’s Bronte Law is three shots off the lead heading into the final round of the inaugural Buick LPGA Shanghai. Law recovered from bogeys on the fifth and ninth at Qizhong Garden Golf Club to collect three birdies in a row from the 12th, while she added another gain on the 16th. She dropped back to eight under overall after a bogey at the last but remains in contention as Spain’s Carlota Ciganda and home favourite Sei Young Kim head a crammed leaderboard. World No 2 Ariya Jutanugarn is one of four players in a tie for third on 10 under.